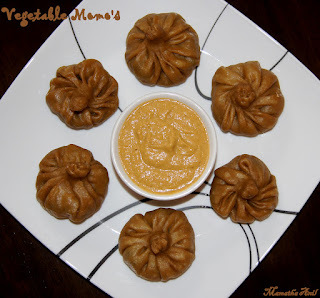 Momo’s (stuffed dumplings) are the traditional and popular fast food in Tibet, Nepal, Bhutan and Sikkim. Momo’s can be meat or vegetable, steamed or fried or cooked in soup. Momo’s are made with all purpose flour but I made with multigrain flour. Combine flour, salt, oil and water in a large bowl mix well and knead the dough till it becomes single mass. Cover the bowl and let it rest for ½ - 1 hr. Heat oil in a pan add ginger, garlic and fry. Add green chillies, cabbage, bell pepper fry and cook for 2 mins. Add spring onions, crushed pepper and fry. Add soy sauce, chilli sauce, salt, cumin powder and spinach. Fry them for few minutes. Add lemon juice and mix well. Switch off the stove and transfer the cooked vegetables into a bowl. Let it cool. Refrigerate for 1 hr. Now take a small portion of dough and roll into 3 inch diameter circles. Make sure the middle part is slightly thicker than the edges. Place 1-2 tsp of filling at the center of the circle. Bring the edges together to the center, pinch and twist to seal it properly. Grease the steamer rack and arrange the dumplings (momo) on the rack, close the lid and steam/cook for 10 minutes. Switch off the stove and serve with Tomato - Bell Pepper Chutney. @ Vanitha..Momo is the new recipe for me tasted for the first time last year at friend's place.